How do you mark a millennium? British pop culture has its rituals to accompany a change of the date: fireworks, lists, and Jools Holland feature prominently. They’re geared for a shift in year. They can be scaled up, just about, to a decade. But a century? A millennium? We were, with hindsight, hopelessly and inevitably unequal to the event, however arbitrary it was. Schedulers flailed, putting together “best of the millennium” shows in which – and how could it have been otherwise? – 900 years went begging. In a milieu where “of all time” means a lifetime at best, a millennium is a preposterous span. Imagining people could think about it seriously was always folly. But in the gap between people’s sense of what the occasion ought to merit, and what was actually on offer, strange things could thrive. This is one of them. Describing “The Millennium Prayer” is a lot easier than listening to it. Originally conceived for an evangelical musical, it’s a high concept record – the words of the Lord’s Prayer draped awkwardly on the music of “Auld Lang Syne”, a spoonful of castor oil holiness as the millennium party got underway. People have rightly pointed out that the record is a mash-up – anticipating an early 00s craze for song-splicings. Nothing could be more suitable – the millennium itself was a mash-up, an ill-synced bootleg of the annual, the familiar and the cosy with a once-in-twenty-lifetimes opportunity for who even knew what. And “The Millennium Prayer” reflects that perfectly, since – as a minute’s listen reveals – the words of the Lord’s Prayer and the tune of “Auld Lang Syne” appear to hate each other quite a lot. And when you look a little more closely at the record, this constant mismatching starts to become a trope, repeating at every level. It’s mash-ups all the way down. Take the Lord’s Prayer itself, which comes in several different versions. Cliff starts with the 1928 Book of Common Prayer text (you can tell from all the “thys”) but then jumps to the English Language Liturgical Consultation version (which is where all the stuff about “the time of trial” rather than “temptation” comes from). Whether the arrangers are trying to broaden the song’s appeal, or salvage its capsized scansion, I’m not sure: it means what you get is a version of the Lord’s Prayer that his public will be almost, but not quite, familiar with. But cutting and rearranging the text doesn’t solve Sir Cliff’s main problem: the Lord’s Prayer is a seventy-word spoken passage generally run through in twenty seconds or so. He is trying to make a four-minute pop record. Even torturing it to fit another song and running through it twice leaves him two minutes to fill. The solution – pragmatic in one light, audacious in another – is simply to write an extra bit. But how much future would there even be? One line of the new material stands out as authentically Biblical sounding – “every tribe and tongue”, a phrase popular with evangelical churches, if Google is any judge – and indeed it is Biblical, but it’s not from Matthew or Luke. In one last mash-up, it’s from Revelation, where it describes those who have been redeemed by the blood of the Lamb – and, a bit later, those who worship the Beast. Let’s assume Cliff means the former. 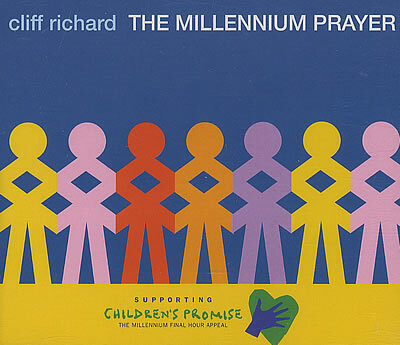 So in “The Millennium Prayer” it works as a basic statement of inclusiveness, a dog-whistle for evangelicals that the record is on their wavelength, and even carries a faint hint of the apocalyptic, one strengthened by references to the kingdom come. This, after all, is what sets the millennium apart from simple ends of decades or even centuries – it’s a celebration that could also be doomsday: party over, oops, out of time. History had snatched away that promise, pushing signs of the apocalypse to the geekier margins of culture: TV serials, cultists, comic books. Replacing it was a wan corporate rebrand of the Festival of Britain, a doom that could be averted not by redemption but by sound information technology practise, and the National Lottery Big Draw 2000 with Dale Winton. It’s no wonder some people wanted something more – something, however cack-handed (and “The Millennium Prayer” is a woeful, clunky, tedious record) that at least gestured towards the enormous. Sir Cliff saw the opportunity, and all the better that radio wouldn’t touch it – it created a narrative he loved, the aging national fixture against the hip young establishment. That sense of comradeship in the face of a fallen world is something the highly religious and the fans of unfashionable pop stars share – it paid off perfectly. The day of judgement arrived, stuck around for three weeks, and played out exactly as prophesied. Rapture for the believers; for the rest of us, purgatory. The talk about airplay brings up something I’ve been wondering about the UK chart: How often does a UK #1 receive very little to no radio play? Any stats on the least-played UK #1’s, or are they still bunnied? On the Billboard Hot 100 it’s very rare for a song to get to number one with little airplay – of course, the fact that airplay is a significant part of the chart formula makes it so. Although I don’t know for certain, I strongly suspect “Harlem Shake” to be the least played #1 in Hot 100 history. The American Idol “coronation” #1’s also tended to get very little radio exposure, and consequently disappeared from the chart very quickly. In the nineties, if you wanted a hit record, the surest way was still to get plenty of exposure on Radio 1. Not everybody had MTV and there were few other outlets at the time. On the one hand Radio 1 were trying to keep up with the times, having ended up looking hopelessly out of date in the early nineties. At the same time you could understand certain acts getting a bit peeved that they were being denied a platform. Their argument was that a lot of young music fans, as well as existing ones, would enjoy their music if they were only given a chance to hear it. This was Cliff Richard’s argument and unfortunately the success of this and, to a lesser extent, Can’t Keep This Feeling In did support his argument. Obviously with hindsight we were in a period of transition as Radio 2 would reinvent themselves as the station catering to the more mature pop fan and would gain a bigger audience than Radio 1 while Youtube would eventually change the relationship between artist and audience, but that was a few years off yet. review from the NME .. I heard this, for the only time, on the radio during a very long* taxi journey – I was a student and I remember having a real “look back and cringe” discussion with the driver about it (I still agree with our eventual consensus: nice idea, interesting move to make a religious connection to the thus far explicitly secular New Year/Millennium hype, appalling execution, laugh out loud bad scansion). I don’t know what station we were listening to though. #29 not to take this in a tedious theological direction (and it’s moot anyway as Tom wasn’t talking about religion and said rapture not Rapture) but I think I’m right in saying it’s mainly us Catholics who believe in purgatory, whereas the notion of the Rapture, in the “left behind” sense most American evangelicals espouse it, came from a virulently anti-Catholic huckster named Cyrus Scofield whose 1900s annotated edition of the King James Bible was unbelievably popular and influential before WW2 (and is still in print by OUP today, selling in healthy numbers, complete with footnotes describing the Pope as the Wh0re of Babylon. Nice guy.) It’s kind of an esoteric distinction from the outside, especially to atheists I guess, but the evangelical Rapture is directly contradictory to the Catholic Church’s teaching on Revelation. So, yeah, they’re probably not the same people. #32 I’m in danger of veering completely off the point, but there were loads of playlist battles at Radio 1 in the eighties. I distinctly remember writing a huffy letter to the station as a teen because they hadn’t playlisted a Depeche Mode track I was certain would have been a huge hit otherwise (I can’t remember which one, but while I wouldn’t be driven to such fanatical extremes now, I suspect I’d still agree with whatever argument I was trying to make. The mid-80s Radio 1 playlists were often tediously middle of the road, favouring polished MOR, AOR and soul over anything with any kind of slight edge at all -and it was that or local radio, where you got more of the same). I got a fairly tedious, noncommittal reply back starting with the lines “Thanks for getting in touch, it’s always great to hear from our listeners!” which you can almost imagine being said in a mid-Atlantic Cliff voice, strangely. In even indier spheres, Fire Records went berserk in the press when Radio 1 refused to playlist The Parachute Men’s “Leeds Station”, arguing that the only reason they’d been neglected was because they weren’t a major label. I found that case baffling then and now – “Leeds Station” is a charming enough single, but there’s nothing special about it at all. It’s no masterpiece. The last time I remember anyone whining about not being Radio 1 playlisted it was, oddly (or perhaps not) Depeche Mode again when the station neglected the completely mediocre “Dream On”. That would have been 2001 at a Wembley gig – and I remember at the time it already felt like a really peculiar thing for a band to be whinging about live on stage, perhaps due to the way that Radio 2 was already shifting and cable/ satellite TV and the accompanying music channels were much more commonly found in British homes. So within the space of a couple of decades I’d gone from scribbling green ink letters to the BBC on their behalf to thinking “Oh, shut up about that lads, it’s a dreary single compared to your usual standards and a top ten hit anyway”. Somebody else will know better than me, but I’m pretty sure that in the last two decades we’ve had singles which were ignored by Radio 1 but playlisted by Radio 2, which slowly sent them up the charts. I think there are a few bunnyables coming up this may apply to. #34 – there is no formal defense against “let’s not get into this” followed by getting into this, so I’ll just suggest you go look it up. Number ones that hit despite not being playlisted by Radio 1, but Radio 2? Well, there’s (bunny), and (bunny), and lets not forget (bunny) but R1 climbed down and added it later. Well, that’s showbusiness. I couldn’t stand this then, I can’t stand it now. Better expounded upon by others but broadly in agreement with much of what the nay-sayers have put forth on this. Writing a second verse for the Lord’s Prayer is a tricky assignment on the face of it, but as a pop legend Sir Cliff had access to the highest drawer of talent. Naturally, he turned to Nigel Wright, formerly of megamixers Mirage. I knew very little about this record, so the first sentence set me up for “Cliff got in Rowan Williams” or “Cliff talked to Basil Hume” or even “Cliff talked to the Vatican” – the punchline, as a result, really tickled me. The old ones are still the best. Mirage might even have been good! I’ve found myself at odds with about 80% of Tom marks for 1999.The likes of ‘I want it that way’ being a bit too high and sunscreen being hard done by.Even recent other ‘1’ records have been a bit divisive. Not the case here. TMP is just horrendous. I said before that Blobby was the worst of the 90s but in my defence I forgot all about Sir Cliff. This is the worst of the decade, not just Number 1’s and for me this is the worst we have encountered so far. Liverpool and Grandma are the yardstick for awful but they’ve got nothing on The Millennium Prayer. Bad and all as they are at least they have a cheerful nature about them. This is one of the most joyless things to ever grace popular and much much worse. A zero wouldn’t have been cruel. Here we have the chosen one in all his finery to deliver the gospel according to cliff,telling the world to bow down to the almighty set to images of hardship building and building before it just falls apart on an avalanche of shouting and hand clapping while the sky seems to be falling in. A deluge of bombast and inpappropriate moralising.The sort of thing you would laugh at if you saw a man with a microphone on the street preaching to others. Here Cliff was indulged by his disciples who really should know better. Similar to Belfast Child this did lasting damage to Cliff.It was nearly impossible to take him seriously afterwards. The stuff of bad dreams. The lowest of the low. A 1 for all eternity. Surely the worst single in the history of this blog. At least the kiddies can dance to Mr Blobby at the school disco. Or you can get trashed on Smirnoff Ice to the Vengaboys. You could make an ashtray out of ‘Grandad’. The Outhere Brothers evoke the inevitable decline of all dominant cultures and civilisations. #31 – from the Nineties, fanbase hits like ‘Bring Your Daughter to the Slaughter’ and ‘Innuendo’ are the first to spring to mind. Also I don’t recall hearing ‘Mr Blobby’ on the radio at any stage, aside from chart rundowns. Having a #1 with little or no airplay must be more common here than in the US, because of the smaller number of units that need to be shifted, but in the download age I wonder if that’s not so much the case as it was 15 years ago? There are/have been performers whose art is at least partly driven by their faith that I have a lot of time for. Johnny Cash springs immediately to mind. Sufjan Stevens is a more recent example. Neither of them rubs your nose in it like Cliff does, and never more sanctimoniously than he does it here. I’m sure I can’t be – no, I know I’m not – the only one of my generation who lost it with Cliff when he got involved with the Festival of Light along with Mary Whitehouse, Frank Pakenham and Malcolm Muggeridge in 1971. ’76 (presumably with a refreshing can of Splunt on hand – hot summer that year) or the utterly forgettable Christmas 1982 single by pop’s first knight being chosen to climax the festive show that year over much more deserving candidates. Indeed, a lot of those old-school DJs look visibly relaxed when introducing a fine entertainer like good old Cliff, not like these awful punk bands with their shocking grammar and anti-social haircuts – Basically, Cliff’s disgruntlement at no longer being play listed from the mid-nineties onwards seems especially petulant when one considers how much, and for how long he was favoured (and quite literally from the beginning as he was one of the first 10 artists to be played on Radio 1 in 1967). As an aside, I recall one John Peel show around this time where he played ‘We Say Yeah!’ (‘Mamma says yeah/Daddy says yeah/Brother says yeah/Maybe they’re not so square’) from ‘The Young Ones’ soundtrack which could possibly have been a sly comment on play listing or even ageism from a Broadcaster who was a year older than Cliff. A fine review of ‘Millennium Prayer’ from Tom – Cliff seemed to be of the view that the idea for this batty single was something that seemed so obvious that it’s a wonder no one else had thought of it, apparently missing the other side of this positive reflection, that it’s an idea so gormless anyone else would have thought better of it – Combining the Lord’s own expression of the divine message and a seasoned melody that continues to ring in the new many many years after it was written , taking two great things of wonder and turning them into one clunky folly. #44 I have to agree – Cliff was so very much of the (publicly) prissy, repressed, Smashie-and-Nicey you-can’t-say-that-mate part of the (pre-Bannister) Radio 1. To be fair, this worked well from around 1979-82 and then again in 1987, when Cliff made a string of more or less consistently good pop records that nodded gently in the direction of contemporary modernity (or in the case of the best of them, “Wired For Sound”, even viewing the avant garde distantly on the horizon). Then….the old guard went. And, as it happened, the quality of Cliff’s singles more more or less regressed, and, (that rather fabulous SAW collaboration aside) they were more and more middle-of-the-road (and, increasingly, dull cover versions). It was a parting of the ways for sure, but both parties took different directions when the road forked. Thing is, I distinctly remember Cliff’ defence being ‘I’m not saying its the best record ever made, but …’ which is a virtual admission of its failings and yet he still feels that being playlisted is something he has earned no matter what he does. Reading this thread has led me down the odd rabbit hole of watching Cliff interview clips on Youtube (not how I imagined I’d be spending my Christmas break) and I keep coming back to this one. Supposedly it involves him defending his right to privacy against press speculation about his sexuality (surely an open goal for eliciting sympathy), but he comes across as shockingly petulant, arrogant and entitled. I don’t have any axe to grind in favour of Sir Cliff – he’s not the most modest of people, and I remember a Q Who The Hell piece by Tom Hibbert in which he seemed to claim the Beatles’ move to Hamburg as a personal triumph for himself in that he and the Shadows had the music scene sewn up (!) – but I do have to defend this, at least up to a point. Which seems iconoclastic in itself. Back on the “Mistletoe and Wine” thread someone said: “A lot of the dissing that Cliff gets seems to be from people who have a latent fear, or at least suspicion, of the expression of genuine religious faith, and criticize the music on the basis of the religion rather than its quality”. It’s interesting to see that even those on here who profess religious faith themselves, including JTS, are sticking the boot in on Cliff – although Mapman132, from a territory where Cliff is, though not unknown, nothing like the cultural fixture he is here, is able to find it moving despite not being particularly religious himself. I’m pretty agnostic, and any interest I have in religion is historic and sociological as opposed to a matter of faith: so I’m looking at this in much the same way as I’d consider a profession of Muslim or Jewish faith getting to number one. As I see it, it’s strong on production values, the marriage of the Lord’s Prayer and Auld Lang Syne isn’t entirely happy but playing fast and loose with Lord’s Prayer texts does help mesh the two (after all it’s not billed as the Lord’s Prayer, so he’s free to introduce whatever extra text he wants) – and overall it comes across as a bold, even courageous performance in a context where Christianity was much more marginal in the UK than it had been even thirty years previously. It might well come across differently, even as nauseating, in the hands of an American televangelist where Christianity has a powerful political influence – but here I’m getting an individual trying to tell us what he believes in and encouraging us to share it as opposed to shoving it down our throats. Like all songs with a message, you don’t have to agree with the message to appreciate the delivery: and although I’m far from Cliff’s biggest fan, I find myself admiring this. Maybe not to the extent of voting for it in the year-end poll, but I’m not going to join in the kicking. There was, of course, a lot of goodwill towards the Quiet One and a recognition that ‘My Sweet Lord’ was a cracking tune – even if it wasn’t exactly his – and the record became his best-known song, still regularly aired on oldies stations. At the other end of the Seventies we had mumsy Lena Martell imploring ‘Sweet Jesus’ to help her through life’s trials. But the opprobrium that received was slight compared to that heaped on ‘The Millennium Prayer.’ I was expecting this to get a good kicking, but for its sincerity alone I can go to a 2. Bold and courageous is right; Cliff must have known it would have little or no airplay and it would come down to him and his fans against the rest of the world. Perhaps he just wanted to remind us all why the millennium was fast approaching. Taking an existing song and completely repackaging it with new text… depending on what definition you take, you could argue it’s the second filk number one. It might be even worse than the first, but I’m not listening to either of “Star Trekkin'” and this to check, much less both. Suffice to say that this is the sound of Cliff Richard boldly going in reverse because he can’t find forward. #48 – A nice and sincere post, mate. I think it might be worth reiterating that my target was more the song itself rather than Cliff, although I would be less than honest if I didn’t add that Cliff singing it didn’t help. It’s just a dreadful, cringe-inducing train wreck of a record and nobody could have carried it off. The logic was easy to understand. At a time when a decade, nay a century, double or quits nay a millennium, was nearing what nearly everyone anxiously assumed was going to be an apocalyptic end, what better way to soothe and comfort their fears and uncertainties on the eve of reconstruction than to set the words of “The Lord’s Prayer” to the tune of “Auld Lang Syne” with a rousing, thrice nay stirring, arrangement; and who better to sing it than the man who started it all – though the nature of that “it” has never quite been defined – the evergreen, the perennial who had been here almost from the beginning? Actually, if they’d wanted, they could have had Vera Lynn or Max Bygraves, both of whom were in that first Top Twelve chart back in November 1952, and both of whom were still available in 1999, but either might have confused The Kids. EMI, however, were by this point wondering whether Cliff himself wasn’t beginning to confuse The Kids. Although he had continued to be a chart regular throughout the nineties – even walking through the pain barrier that was Heathcliff: The Musical – none of his nineties hits really defined him in terms of that decade in the way that, say, “Devil Woman” or “We Don’t Talk Anymore” did in the seventies or “Wired For Sound” in the eighties. Worse, despite the occasional very good single (“I Still Believe In You,” “Can’t Keep This Feeling In”), Cliff’s records were becoming increasingly sententious and portentous – see 1993’s “Peace In Our Time” for a particularly acrid example of this tendency – and rather than cantering cheerfully through the decade as he had done with the previous three-and-a-bit ones, there seemed to be a return of the early seventies Festival Of Light air of pomposity and self-righteous arrogance about him. Perhaps he was feeling a little insecure; EMI were extremely dubious about the merits of “The Millennium Prayer” and he quietly severed his connections with the label in 1999, after forty-one years, releasing the single on the independent Papillon imprint. Furthermore, Radio 1, desperate to hold onto their 15-24 year old core audience and not wanting to be sold off to the highest commercial bidder, were more than lukewarm about playing the record, although Radio 2 stood firmly behind it (in the hope that no one might see them). Nonetheless his fans rallied round, as they have always done in times of crisis – and it became the year’s third biggest selling single (Britney was rightly top, Eiffel 65 a somewhat surprising second). There really isn’t much to say about “Prayer” except that it does indeed come over as rather pompous, with its skirling pipes, Highland strings, massed tribal drumbeats, sweeping viaducts of choirs; over it Cliff intones the familiar words, though he prays to be led not to “the time of trial” rather than temptation, and asks that we forgive our sins rather than our debts or our trespass (maybe he’d just received a tax bill) before launching into the somewhat less poetic diving board strains of “Let all the people say Amen!/In every tribe and tongue” and similar well meaning homilies. Beneath the surface of goodwill appears to lurk a grey gavel of mirthless authority. “The Millennium Prayer” was hugely, and perhaps defiantly, popular but it is difficult for the non-doctrinaire Cliff devotee to approach or admire. And it didn’t fulfill his ambition to have the last number one single of the millennium; The Man (using The Kids as a tool) decided to show him who was boss. I think the US equivalent of this was Kenny G’s cover of Auld Lang Syne, with snippets of news events and other soundbites of the 20th century. Main memory was the juxtaposition of the Clinton scandal and the “watch me pull a rabbit out my hat!’ sketch from Rocky & Bullwinkle. Made #7 for about a minute at the turn of the millennium. Can neither get too upset, nor too excited by this one. Not one of Cliff’s best for sure, but I’m leaning towards 4 or 5/10.